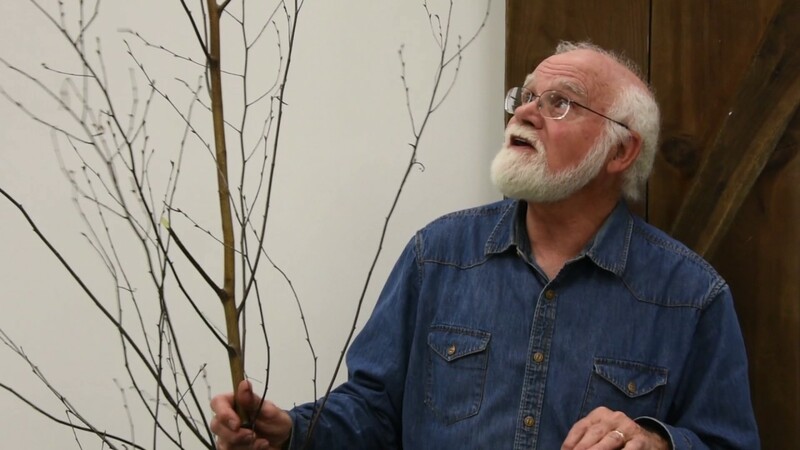 Buying wood—be it pine, basswood, or something exotic like rosewood—can leave you scratching your head wondering about the mathematics and vocabulary. When I first started purchasing wood, I fell in love with a piece of mahogany, ideal for an exotic fish I had in mind. The owner of the lumber yard told me the best deal was to purchase several board feet of 8/4 “undressed” and plain-sawn stock. I’m sure he recognized my confusion, but he simply wrote up the bill and took my money without explanation. At that point, I decided to demystify the process that leads to owning a great piece of wood. Having a basic knowledge of the terminology used, and methods of wood preparation, will enable you to purchase the stock best suited for your project. Many lumber yards have a price list, which can save you a lot of time otherwise spent looking for a favorite wood that isn’t in stock. 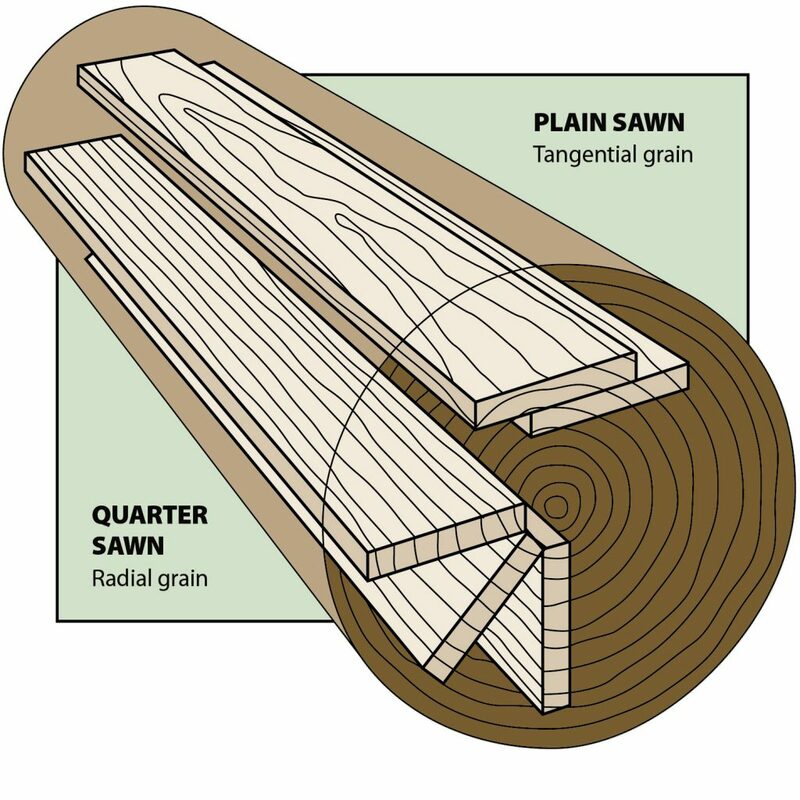 There are two main ways that a log can be cut into boards: plain sawn, sometimes called flat sawn, and quarter sawn. Each method has its pros and cons. Plain-sawn boards are cut in slabs across the log. The log is fed into the sawmill in one piece and each slice is cut all the way through the log. This type of cut produces an attractive grain which is visible across the board. Plain-sawing requires less skill from the sawyer and is therefore more readily available. While this type of lumber manufacturing produces stock in wider dimensions, it does have a higher tendency to cup or warp as the wood dries (see Wood Defects on page 72). Quarter-sawn boards are from logs that have been cut into four sections. Each log quarter is then cut into boards. This produces boards where the grain is at right angles to the face of the board. Quarter-sawn boards are less likely to cup or warp. Because quarter-sawn boards are cut from a quarter of a log, they are usually not as wide as flat-sawn boards. These boards are more difficult to cut, so they are usually harder to find and tend to be more expensive. Before this piece of English lime was surfaced, it was almost impossible to see the pin knots and curly grain beneath the roughness. After a piece of wood is sawn, in most cases it needs to be dried. 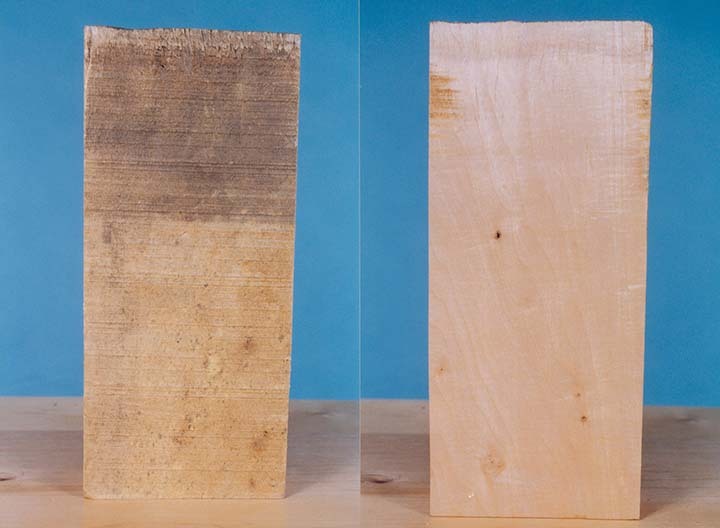 For centuries, wood has been air dried. The wood is stacked, with the boards separated to allow air to circulate. Today, most lumber goes to a kiln for drying. The biggest benefit of kiln drying being the reduction of time needed. Wood does not kiln-dry well if it is more than 4″ thick, and some exotic species, even 2″ thick, split apart when put in a kiln. Air drying can take a year or more. Kiln drying speeds up the process to three or four weeks. There is an ongoing debate about how the drying process affects the wood. 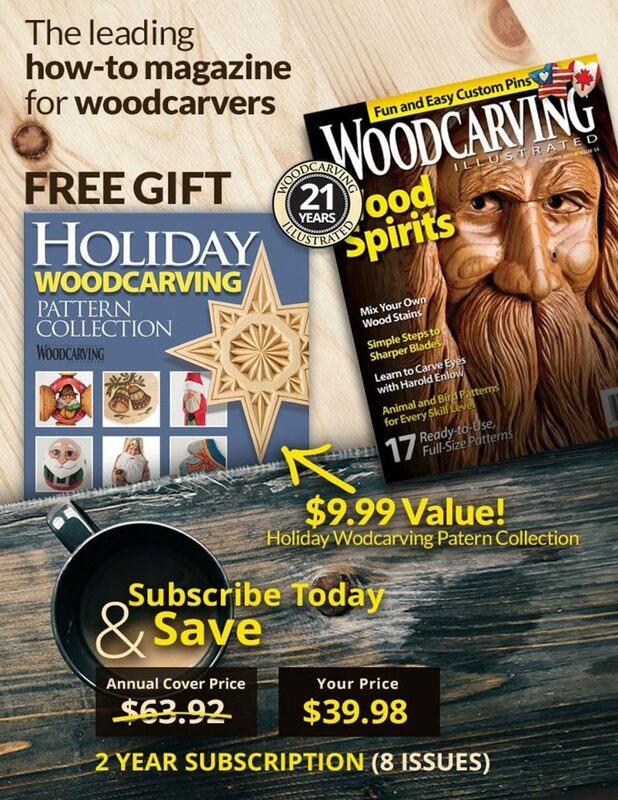 Some carvers say that kiln-drying makes the wood harder. Others feel that there are more defects in air-dried lumber. The only place I’ve found a significant difference in lumber that has been air-dried vs. lumber that was kiln-dried is with black walnut. During the kiln-drying process, walnut is often steamed, which darkens the sapwood and lightens the heartwood, so it is a uniform color through the whole piece of wood. It doesn’t make the wood unattractive, but it is something to keep in mind when you are planning a project. Air-dried walnut shows a sharp color shift from light to dark between the sapwood and heartwood. One advantage to kiln-drying is that the higher temperatures tend to kill off any parasites, such as fungus, insects, or bacteria, that are in the wood. There is a movement in the country that would require that any wood shipped from one state to another be kiln-dried to prevent the spread of theses parasites. The difference in the level of machining or preparation can also be referred to as dressed and undressed. 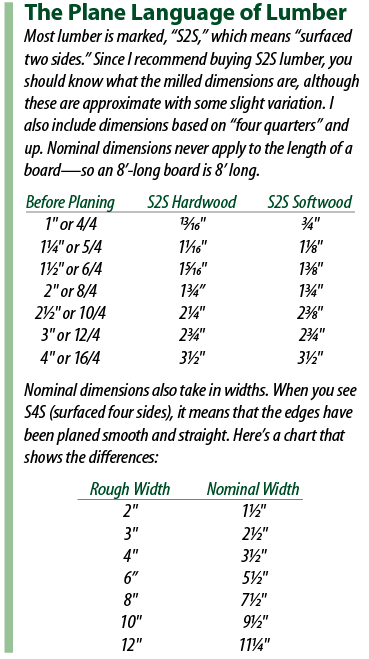 In some lumber yards, you can still find a board that measures a full 2″, 3″, or even 4″ thick. Unfortunately, it probably has not been planed yet—it’s unsurfaced or rough sawn. The problem with rough-sawn lumber is that it’s impossible to see what kinds of problems lurk underneath. Some defects become obvious once the wood is planed, but they are all but invisible in rough sawn lumber. 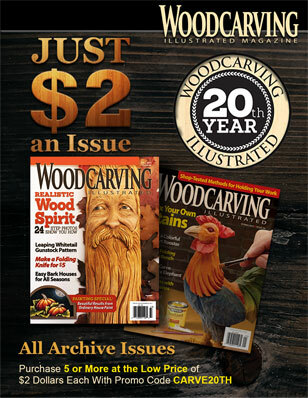 Lots of wood dealers have their boards already planed, so reading the grain is easy to do. Others have a planer on hand to provide dressed lumber, although there’s usually a charge. Bottom line: Go where the boards are already surfaced. Ask to carry the wood outside if that’s what it takes to look for defects. Unfortunately, most lumber is stored in warehouse-like structures, where lighting is dim. Other major defects include checks and splits, which are essentially cracks that are usually the result of uneven drying. It happens to both air-dried and kiln-dried lumber. Most of the cracks are on the end of a board, so it’s easy to cut the defect away, but that’s money lost. Sometimes you’ll hear that a board is “cupped.” This means there is a hollow in the center of the board where the sides have warped up. On the other hand, a bow is when the board warps along its length. A twist is when it does both. These problems can be corrected, but it is a lot of work! Since I glue up a lot of panels for relief carving, I take a board, hold it at eye level, and sight along its length. Severe distortions mean I reject the wood; but minor ones I can handle, even though it means time spent woodworking rather than carving. I also dread finding stains in a board. They usually appear where you least expect them, and they are very difficult to cover up, even with paint. Minerals in the wood cause stains. Fungus is another culprit, creating an effect called spalting. With thin boards, stains are usually visible and are rejected. But when they reveal themselves only during carving, they are more difficult to deal with and sometimes may require you to scrap the entire project. There are a few other possible defects. Worms bore through wood—especially butternut—and leave behind holes, ruining many fine boards. And then there’s gum, pitch, or sap, which are resinous liquids that show up both on the surface and in pockets under the surface of the wood. This goo sticks to tools and makes finishing difficult. Now that you understand how wood is prepared, and the defects to look out for, it’s time to discuss how wood is sold. Lumber is measured and priced by volume. Most of us understand that a 2 x 4 isn’t really 2″ x 4″. It started that way when it was cut at the sawmill, but the board was then passed through a planer, which smoothed 1/2″ off both faces and edges, giving you a board measuring 11/2″ x 31/2″. Many types of wood are sold by the board foot—which is calculated on the rough dimensions. I’ve purchased 1″ walnut that was milled to 3/4″, 13⁄16“, and 7/8”. I recently bought some white oak boards that measured 15⁄16” thick, but there were a lot of skips—meaning that the boards should have gone through the planer at least one more time. 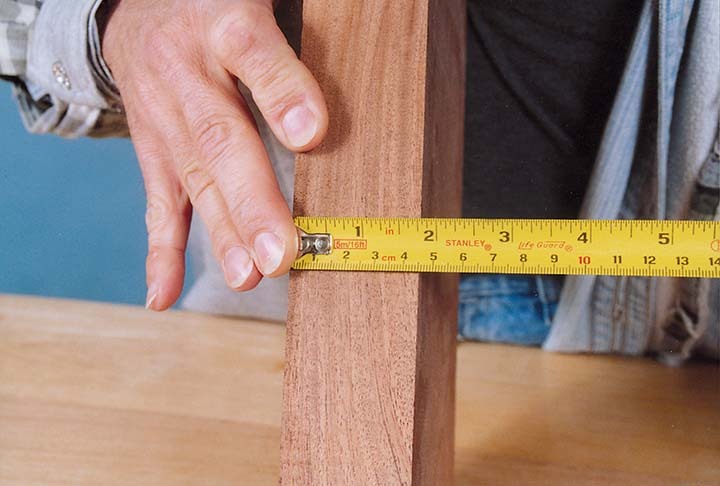 For most 1″ hardwood lumber, the nominal thickness should be 13⁄16” or 7/8″. With thicker boards, the discrepancies seem to disappear. Most surfaced 2″ hardwood lumber is exactly 13/4″ thick. In most cases, lumber thickness is given in “quarters.” In the hardwood lumber industry, 4/4 is 1“-thick lumber and 8/4 is 2″-thick lumber. Reduce the fraction to a whole number, and you have the thickness in inches. It’s still very confusing, because the quarters could refer to the wood surfaced or unsurfaced. Yard workers do make mistakes in their measurements. I now carry a small tape measure when I go to purchase wood. To paraphrase an old saying, measure twice and buy once. Take a pocket calculator along with you. Once you learn the math, you can save yourself a lot of hassle. Wood can be purchased at sawmills, lumber yards or through mail order or websites. I’ve had mixed success with mail-ordered wood. Sight unseen is the best reason not to buy. What is the price per board foot of the wood? What are the exact dimensions of the wood? How has the wood been dried? If air dried, what is the moisture content? How is the wood to be shipped? What will the postage be? I recommend you tell the customer service representative what you want the wood for. Place a small order if you haven’t used the company before. If you are disappointed with the wood, don’t order from them again. The biggest advantage to buying from a sawmill is the opportunity to find a sizeable piece of wood. The sawmill is responsible for cutting the tree into lumber, and the lumber yard makes the sale. It’s also possible to find a sawmill where you can buy wood. There are two potential problems with sawmill lumber. First, it’s unlikely that you’ll find surfaced wood. That’s not really what a mill is in business for. Second, the wood may not yet be adequately dried. The sawmill does offer you the opportunity to get wood that is not available anywhere else. Many small sawmills will cut logs for you, but they usually require a minimum length, and of course you will need to transport the wood. Purchasing from a lumber yard is probably the most common method. You have the advantage of being able to spot defects in surfaced or dressed lumber and often have a wide variety of wood available to choose from. Some hardwood lumber companies allow you to pull boards by yourself. But make sure they are returned to the stacks the way you found them. Other companies discourage customers from pulling boards from the stacks. Always ask about the lumber yard’s policy beforehand. A gratuity might be in order for a helpful yard worker. I rarely leave a yard with less than $100 worth of wood, so $5 is a small price to pay to protect my back and hands. Editor’s Note: The words “wood,” “boards,” and “lumber” are often used interchangeably. Apologies to the purists who know the subtle differences between them.